As the event comes to a close it's time for a small piece of quiet reflection! As is customary we have created a short feedback survery that is only available to participants at epic.SIX which covers a few topics from venue to big games. Using the survey it allows us to be a bit clever with Excel and make some pretty graphs; it makes it far more valuable. Anyway, find the survey under "My Account" => "Surveys". Any problems, let us know! We've been running our series of fun tournaments over the course of this event. A big thanks to everyone who took part. You have all been awarded the relevant achievements, if you've been missed drop me a PM and I'll get that fixed! Congratulations to all our winners and a big thankyou to our sponsors Tt esports and Aqua Tuning! 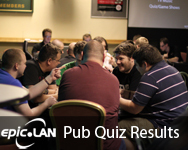 Saturday night is always a great laugh at epic.LAN with the epic.Quiz that takes place in our Hall 1 bar. As always, we release the results and rankings so that you can see how little you really know about current affairs or the extent of your gaming theme tunes expertise! A big congratulations to "Rupert Murdoch says he is touched by all the messages left on Amy Winhouse's answerphone" who have re-taken the crown. Congratulations to Rasta.Xd who won the Tt eSPORTS epic.SIX Counter-Strike: Source Tournament. Thank you to everyone for taking part, and we hope to see you all at epic.SEVEN in October. If you are in the CSS tournament, ensure that your team has signed up in full to the tournament system by 8pm Thursday. If you are planning on spectating the event or you have visitors coming to see you, please create a spectator booking on the system in advance, it's still fine to pay on the door, but will save time on the day. Remember, the doors open at 4pm, if you arrive any earlier we'll have to ask you to wait outside or in the Railway Bar sleeping area. Following on from the fun we've had at previous events and on numerous epic.Thursdays, TF2 Dodgeball will be getting an official slot on our timetable. But not only that, it will be one of our fun tournaments in Hall 1. For those who don't know, playing is very simple, as you may not even have to move to let your team succeed. Both teams will spawn on their respective sides of a symmetrical arena, where they may or may not be able to reach the enemy teams side, which depends on the map. A specific spawn point, usually high up and is in the split center of the arena, spawns Critical rockets that home on one random player, which must be airblasted to the other team or the crocket will explode on contact with the pyro who failed to airblast it, forcing him to spectate until a new game starts, as dodgeball functions like arena mode. The format is extremelly simple; tried and tested. It's 3 vs 3 in a knock out competition with the 2 final teams battling it out on Sunday for overal victory! Don't be the one to hear "You've failed! BOOOOO!". So get practicing firing your lady cotton at moving rocket targets! If you've still not signed up for epic.SIX and want to take one of the remaining spaces, head over to the booking page and signup! On Friday afternoon at epic.SIX, we'll be releasing our Bigfoot into the wild. At 4pm, we'll display the first clue, all you need to do is follow the clues to be the first one to find Bigfoot's Bling. The first one to return it to us will win a Killer 2100 Gaming Network Card. The clues will be slightly cryptic, but a lot easier than the old epic.Hunt! Everyone will be racing at the same time to be the first get the card. Keep an eye on the event intranet for the first clue on Friday! In case it is a warm weekend, we are going to permit small desk fans on a trial basis at epic.SIX, allowing up to one per table (i.e. shared between 2 people). We will monitor the power situation to ensure it remains stable with the fans running. Please come prepared for a warm venue! As usual we will be running our tuck shop 24h a day throughout the LAN where you can purchase snacks, energy drinks etc. Our main shop will be located in Hall 2 at the main staff area with a smaller outlet in Hall 1. For full meals, don't forget we have our om nom nom van open just outside the main entrance. Some of our main products follow to give you an idea of our range, however exact availability and pricing will be confirmed at the event.